Promotional materials are part of any conference. In scientific meetings, the swag usually comes from the booths of product promoters, science publishers, and scientific societies. 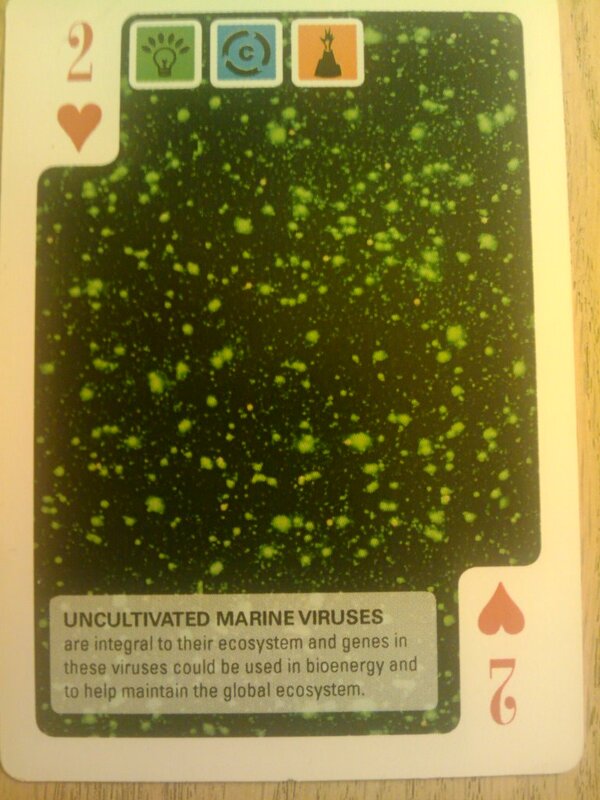 It was a nice surprise to see a Federal funding agency, the US Department of Energy give away decks of cards. I’m a sucker for cards, so I took a deck. (Full disclosure: I received a grant from DOE which partially funded a meeting I held last year.) 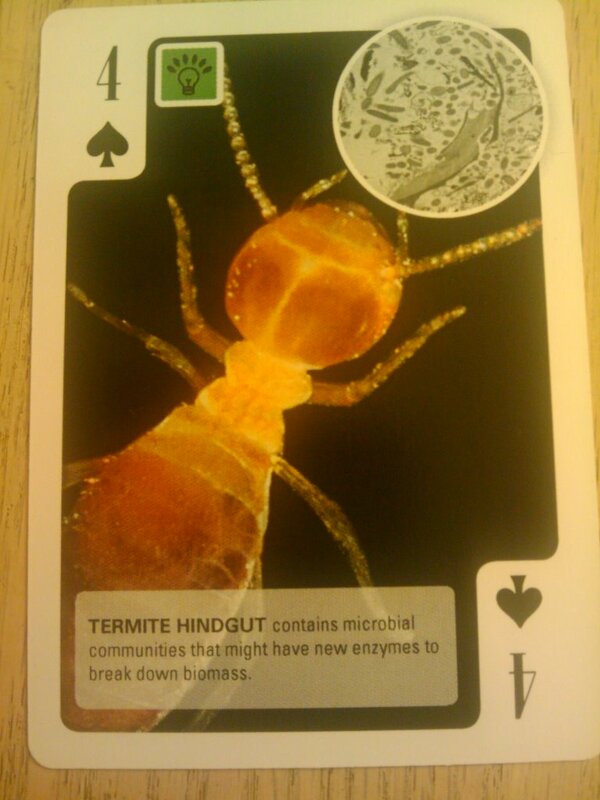 .The cards show organisms and microbial communities whose genome sequences are of interest to the DOE’s Biological and Environmental Research program. 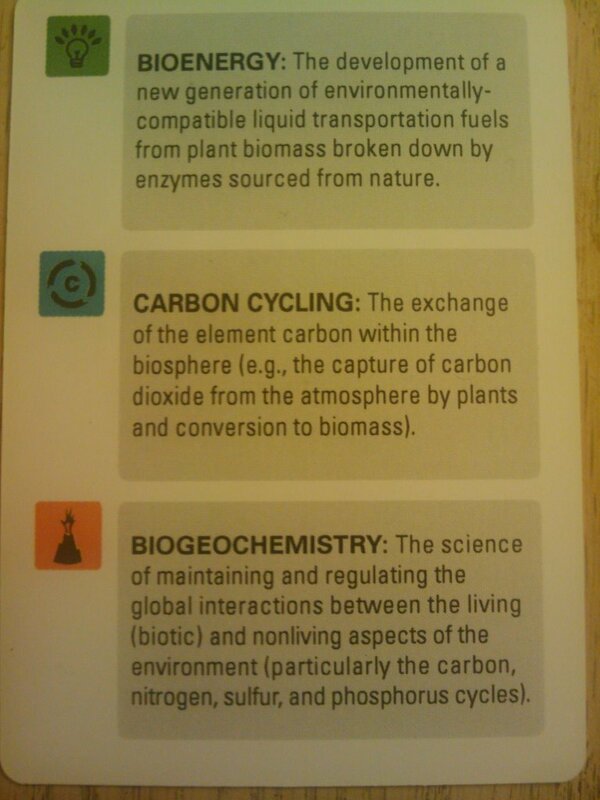 The cards show various organisms relevant to the BER’s mission of funding research into bioenergy, Carbon cycling, and Biogeochmistry. More details and some sample cards in the gallery. FASEB, the Federation of American Societies for Experimental Biology also gave out promotional materials. They had bumper stickers and buttons advocating teaching evolution. The intentions behind this bumper sticker are good, but the result is somewhat ironic. CORRECTION: One important mechanism of evolution, natural selection, does result in the evolution of improved abilities to survive and reproduce; however, this does not mean that evolution is progressive — for several reasons. First, as described in a misconception below (link to “Natural selection produces organisms perfectly suited to their environments”), natural selection does not produce organisms perfectly suited to their environments. It often allows the survival of individuals with a range of traits — individuals that are “good enough” to survive. Hence, evolutionary change is not always necessary for species to persist. Many taxa (like some mosses, fungi, sharks, opossums, and crayfish) have changed little physically over great expanses of time. Second, there are other mechanisms of evolution that don’t cause adaptive change. Mutation, migration, and genetic drift may cause populations to evolve in ways that are actually harmful overall or make them less suitable for their environments. For example, the Afrikaner population of South Africa has an unusually high frequency of the gene responsible for Huntington’s disease because the gene version drifted to high frequency as the population grew from a small starting population. Finally, the whole idea of “progress” doesn’t make sense when it comes to evolution. Climates change, rivers shift course, new competitors invade — and an organism with traits that are beneficial in one situation may be poorly equipped for survival when the environment changes. And even if we focus on a single environment and habitat, the idea of how to measure “progress” is skewed by the perspective of the observer. From a plant’s perspective, the best measure of progress might be photosynthetic ability; from a spider’s it might be the efficiency of a venom delivery system; from a human’s, cognitive ability. It is tempting to see evolution as a grand progressive ladder with Homo sapiens emerging at the top. But evolution produces a tree, not a ladder — and we are just one of many twigs on the tree. Second, the “march of progress” also shows species replacement, leading to the mistaken concept (related to the “progress” concept) that the later and more “progressive” species replace the “less progressive” ones. 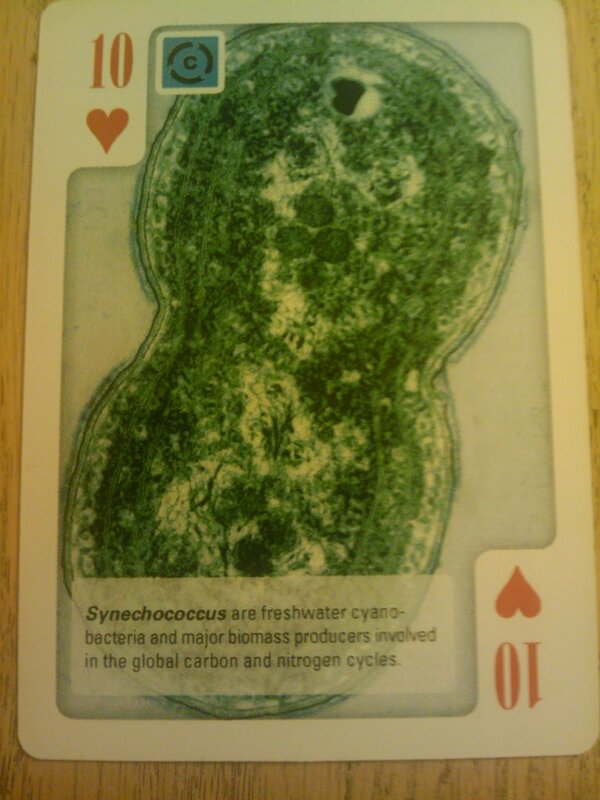 Evidence to the contrary is evident in the fact that the lion’s share of life on earth is comprised of microbes. The species replacement misconception is also seized upon as a strawman argument by creationists, most famously the argument “If evolution is true why are there still monkeys”? The answer is threefold: first, humans did not evolve from monkeys, but rather humans and monkeys evolved from a common ancestor. Second, humans are not “more advanced” than monkeys (see above), at least not in light of evolution. Finally, the concept that the “more advanced” species replace the “less advanced” is patently wrong (and, in itself, is based upon a wrong premise of the “progress” concept). 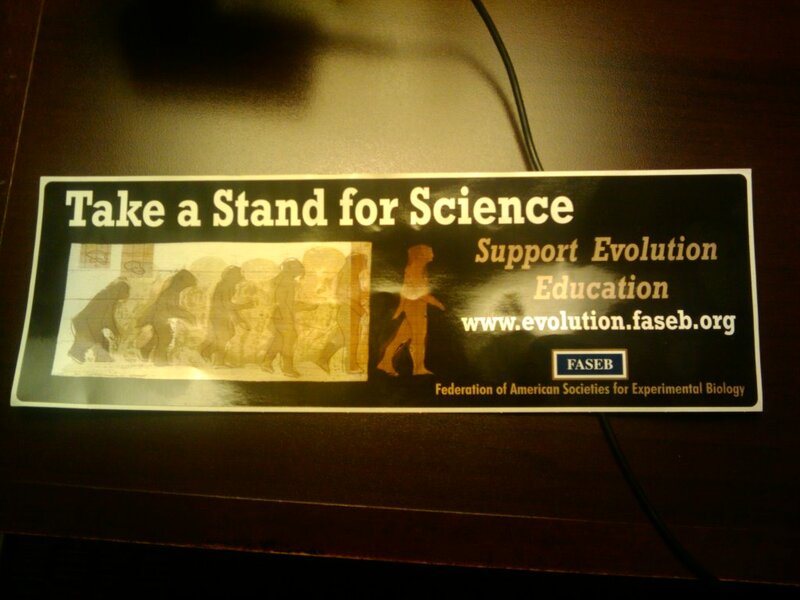 So while FASEB does have thousands of members who understand evolution, it is unfortunate none of them reviewed the design of this sticker. 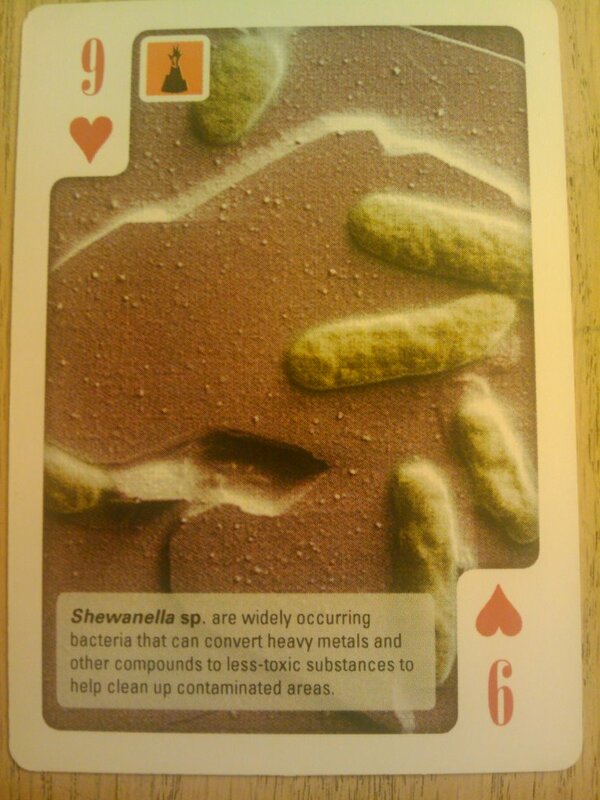 Categorized under: Biology, Evolution, Metagenomics, Microbiology, Science. 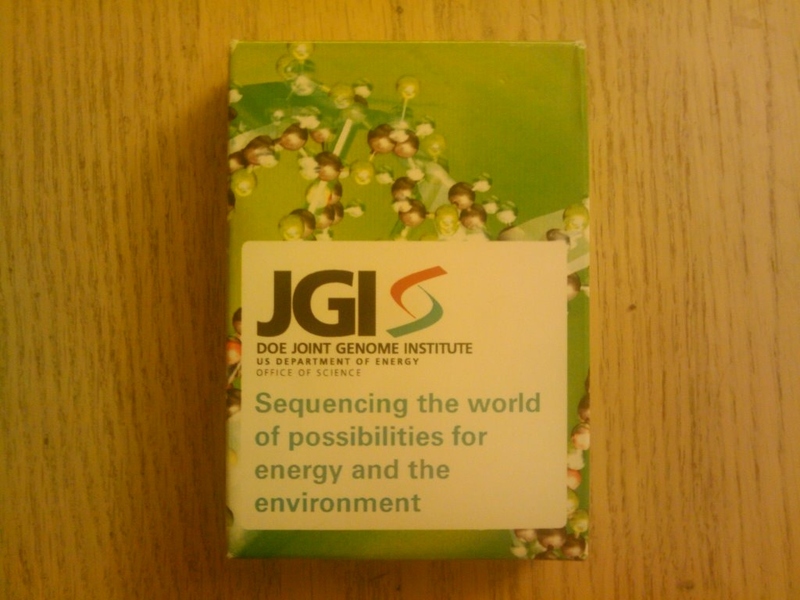 Tagged with: Education, evolution, games, genomics, science culture, Science education.